The program starts in Medan where we fetch you from Kuala Namu airport. From Singapore or Kuala Lumpur it is a one hour flight to Medan. Overnight in Hotel Deli River in a tropical garden. The next day there is an architectural citytour through Medan. On day 3 you depart for Bohorok / Bukit Lawang to see the orang utans in their natural environment and get information from your guide about the fauna and flora of Gunung Leuser National Park. From Bohorok / Bukit Lawang you depart for Brastagi in the Karo Highlands where you can view 2 volcanoes. Brastagi has also still authentic villages where you can see the Karo architecture. From here you depart for the impressive Sipisopiso waterfall and the Long House of King Purba. In the afternoon you cross Lake Toba, the largest lake of Southeast Asia, to the beautiful island of Samosir. After spending 2 days at this wonderful island you continue the long way to West Sumatra. It is an impressive route through the Bukit Barisan Mountain Range. On the way you stay overnight in Padang Sidempuan on the Trans Sumatra Highway. The next day you arrive in the cool mountain city of Bukittinggi in the Minangkabau Highlands with its unique matrilineal culture. In Bukittinggi you explore the fascinating Minangkabau Highlands like Maninjau and the Harau Reserve. The tour ends after 12 days in Padang where we drop you at the airport. Arrival in Medan Kuala Namu airport with flight number..
We will fetch you from the airport and transfer to Hotel Deli River for 2 overnight stays, nicely situated in a tropical garden with beautifull view to the Deli River. Here you can rest after the long journey or swim or walk in the neighbourhood. Today depart for Bohorok/Bukit Lawang, the orang utan rehabilitation centre in the Gunung Leuser nature reserve. The route takes around 3,5 hours via many rubber- and palmoil plantations. In this impressive nature reserve you can see the orang utans in their natural environment with short jungle trekking for 3 hours with an experienced local guide in the tropical primary rainforest to see Orang utans, Siamang (long arm apes), Thomas Leave Monkeys, long tail Macaque, Gibbon, different kinds of reptiles and varieties of birds. Overnight stay in Ecolodge Bukit Lawang or Rindu Alam or Sam’s Bungalow or Batu Mandi in Bukit Lawang. Bukit Lawang – Brastagi (5 – 6 hours drive). Today you drive to Brastagi via Medan. Impressive route through the jungle to the mountain village of Brastagi in the Karo highlands. In the afternoon you will arrive at the cool mountain resort of Brastagi. Here you can view two active volcanoes, the Sibayak and the Sinabung. Overnight stay in hotel Sinabung or Mikie Holiday Resort or Grand Mutiara in Brastagi. After breakfast leave for Prapat at the famous Lake Toba. On the way stops at traditional villages to see authentic Karo houses, the Sipiso Piso waterfall, at the longhouse of King Purba and at pineapple-, coffee- and ginger plantations. In the afternoon you arrive in Prapat at lake Toba. 2 overnight stays in hotel Toledo Inn or Tabo Cottages or Carolina Cottage on Samosir island, your hotel is situated right at the lake side. Samosir – tour to Tomok, Ambarita and Simanindo. On this beautiful island you can visit the typical Toba Batak villages: Tomok with its kings’ tombs, Ambarita with its execution tables and in Simanindo you can see traditional Batak dances. Overnight stay on Samosir. In the early morning you will cross the lake to Prapat from where you leave for Padang Sidempuan. Along the southern shores of lake Toba with its lovely ricefields and huge Batak kings’ graves you travel through the Toba highlands. During the trip you will pass hot sulphur springs at Sipoholon. From Tarutung, the center of the Protestant Batak church, you continue driving until Padang Sidempuan, a city in the middle of Mandailing land. Overnight stay in hotel Mega Permata in Padang Sidempuan. The route to Bukittingi in the Minangkabau highlands brings you again right through the Bukit Barisan mountainical ridge of Sumatra. It is an impressive tour in which you drive through a wall of tropical rain forest. En route you pass the equator in the place Bonjol. In the afternoon we arrive in the cool and pleasant town of Bukittingi. 2 overnight stays in hotel Denai or Novotel Hotel or Grand Rocky in Bukittinggi. Today you proceed to Maninjau via the silver town of Kota Gadang, on the other side of the deep canyon besides Bukittinggi. For the sportive hiker the one hour walk through the impressive Karbouwengat or Ngrai Sianok to Kota Gadang is a must! (optional). From Kota Gadang you will be picked up by the car for departure to the mysterious lake Maninjau, descending to the lake via the road with forty four curves. The lake is clean and still and excellent for swimming. In the afternoon you drive back to Bukittinggi. In the morning there is a tour to the former Fort De Kock, situated on a strategic point on a high mountain. You then also visit the colourful market and the museum of Bukittinggi. 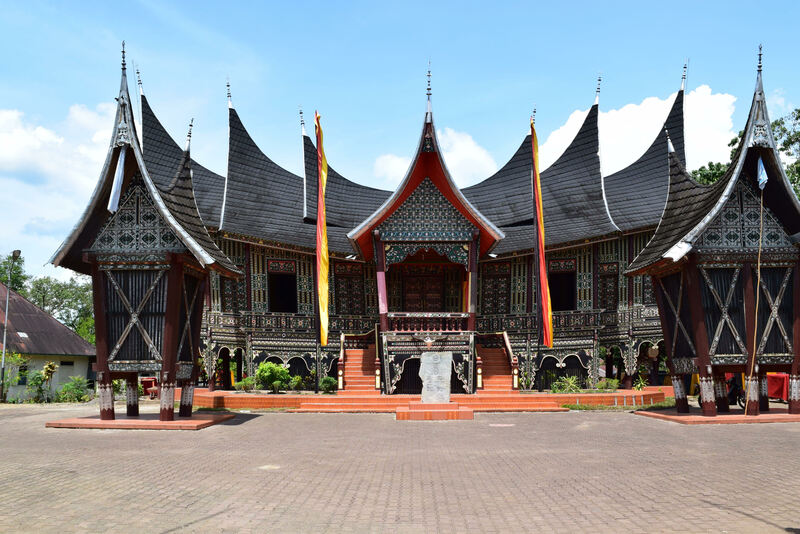 Around noon you depart for the Minangkabau Palace in Pagaruyung where you will see various aspects of the matriarchal society of the Minangkabau. Our next destination is the Harau nature reserve, famous for its huge rock formations and delightful butterflies. Overnight stay in Iqbal Homestay in Harau. Today you drive to Padang. En route you pass Batusangkar where you will see historic rock inscriptions in Hindu-Indian Sanscrit language. Hereafter you continue to Padang via the beautiful Anai valley with the Anai waterfall. The harbour city of Padang on the Indian ocean is the economic centre of West Sumatra. On arrival there is a city tour of Padang. Overnight stay in Hotel Pangeran’s Beach or Grand Zuri in Padang. Transfer to the airport for the flight to your next destination. End of your individual tour over Sumatra. 2 to 3 persons US $ 1100 -per person. 4 to 6 persons US $ 900 -per person. 7 to 10 persons US $ 760 -per person. – personal expenses such as: drinks, souvenirs, lunch, dinner etc. We can tailor made the above tour according to your wishes. Please send us an inquiry.